Below are videos of a variety of topics including self-compassion, self-care, healthy relationships and getting through difficult times. I hope they are a blessing to you. I was honored to talk with Dr. Christina Hibbert about “Helping Children and Teens Grieve.” Loss is part of childhood, whether it’s from moving, losing friends, or experiencing a parent’s divorce to experiencing death–of a pet, grandparent, or other loved one. It’s hard enough for adults to comprehend loss and know how to grieve, but unless children have someone to show them how, they can easily become overwhelmed and afraid. What can we, as parents, do to help our children identify their losses and learn to grieve? Dr. Christina Hibbert sits down with Kim Fredrickson, Marriage and Family Therapist to discuss their strategies for helping children and teens understand loss and learn to grieve. As parents learn about loss and grief, we become empowered to help our kids identify, validate, and work through their grief, too. Kim is the author of Give Your Kids a Break: Parenting with Compassion for You and Your Children, and The Power of Positive Self-Talk. Kim shares a health update (breast cancer and the resulting development of pulmonary fibrosis). She shares how helpful being compassionate with herself has been so helpful through this process, and talks about the many reasons we have trouble being compassionate with ourselves and some practical tips to get started. How we can have compassion for those in our lives (spouse, children, friends, workmates, etc), especially when you don’t relate to or naturally have compassion for their struggles? Kim also shares how we can be kind to ourselves about this struggle, because it is a common reaction to be down on yourself for not being understanding why your spouse, child or friend are struggling. How Can I Have Compassion for Myself When I Struggle with Eating Healthy and Exercise? How can I have compassion for myself when I struggle with eating healthy and exercise? If I’m compassionate with myself, isn’t it just an excuse to do whatever I want? Kim helps us understand this struggle and shares how being compassionate with ourselves actually helps this struggle! She even shares compassionate words to say to yourself! What matters most to you? Do you give those things/people the time and attention they deserve? Do you ever take those things for granted? What about when life gets difficult? Are you able to keep the meaning and purpose of your life even in the toughest times? Dr. Hibbert welcomes special guest, Kim Fredrickson, mother, wife, author of “Give Yourself a Break,” and therapist of over 30 years (www.kimfredrickson.com). Kim is living with a terminal illness, but despite her declining health she has found a way to live with meaning, purpose, and to focus on what matters most as she copes. How can we do the same in our difficult life experiences? Kim and Dr. Hibbert discuss the skills of focusing on the moment, making memories that last, exercising faith, practicing self-compassion, and grieving well the losses that come our way, in order to “overcome, become, and flourish” in even the toughest times of life. “How do I balance love, compassion and boundaries?” She shares 6 major things you need to consider in order to make wise, healthy decisions that consider you and the other person. Kim covers the delicate balance of our faith, love, compassion, and setting healthy boundaries. Whether we like it or not…Life is always changing! Right when we think we’ve got things figured out, it changes! Kim shares practical and compassionate tools to help you process and adjust to the changes that are happening in your life. It is normal to feel mixed up and confused and not know what to do when life changes. Change is stressful and requires us to adjust and process through the logistics of what is happening as well as the emotions of these changing situations. It is very important to find ways to respond to yourself kindly during the changing situations you are going through. Kim shares three strategies to help you navigate these changes, as well as important questions to ask yourself, and compassionate words to say to yourself. One of the hardest things for parents, and especially moms, to do is give themselves a break. When life is busy and stressful, as it always is, when you make mistakes, when you just don’t know what to do–self-compassion is what’s needed most. But how do we learn to practice self-kindness, self-love, and self-compassion? And how can we extend that compassion, and teach it to, our children? Dr. Hibbert welcomes guest Kim Fredrickson, author of The Power of Positive Self-Talk and Give Your Kids a Break, licensed marriage and family therapist of 30+ years, and true survivor in every sense of the word (www.kimfredrickson.com). 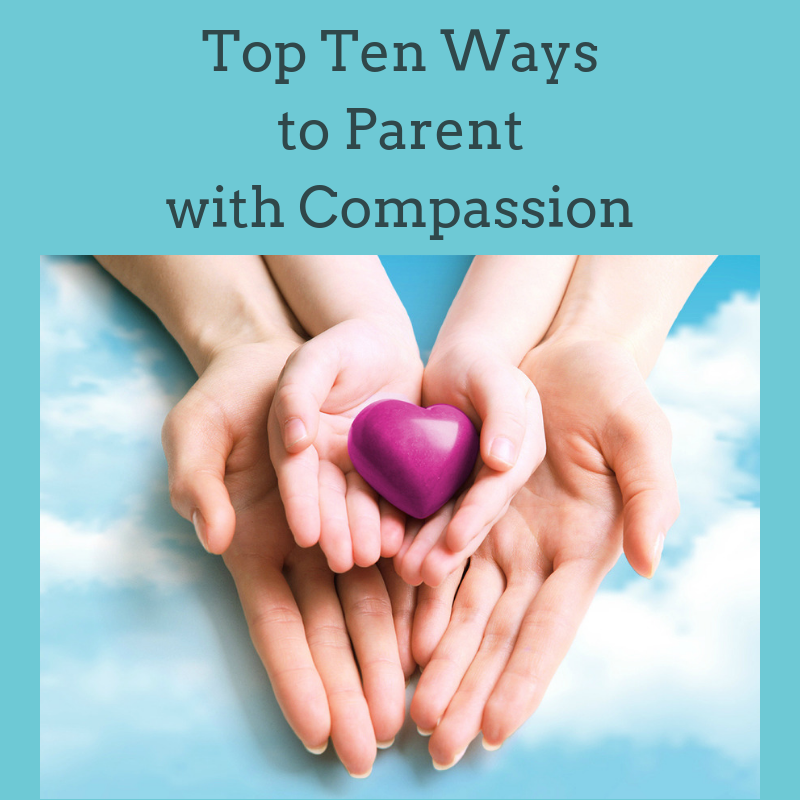 Together, they share the secrets to living with self-compassion and the tools for teaching your children. A powerful, inspiring episode not to be missed! Are you able to forgive others, but have trouble forgiving yourself? This is a very common problem. The inability to forgive yourself causes so much pain and suffering. It’s like a double whammy…you already feel bad about whatever happened, and then on top of it you can’t forgive yourself…this is so hard. Many of us have trouble feeling forgiven even if we made things right with God and/or the others person involved. We often feel like we either need to punish ourselves for what happened, or make up for it because we have no way of letting it go. The missing piece is forgiving yourself. Kim shares some practical and compassionate tips to help you forgive yourself. She covers the many reasons we have trouble, what the Bible says, and how self-compassion helps. Kim shares important questions to ask yourself, and compassionate words to help you extend forgiveness to yourself. It’s not too late to learn! Kim shares words of encouragement, compassion and hope to soothe your soul…no matter what you are going through. Most people struggle with believing they are valuable, precious, and of great value. So if you struggle with taking in this truth, you are normal. Kim shares why this is true, and speaks encouraging statements to you, that you can say to yourself. Feel confused or controlled by your emotions? Join me as I share healthy ways to learn from your emotions without being controlled by them. Kim shares practical steps to get you started! Want a better way to deal with your emotions? Kim shares about the three unhealthy ways to handle your emotions, and the one that really works! She brings understanding to how you learned the style you have, what to do about it, and compassionate words to say to yourself. Boundaries can be tough to set, especially with those we serve at work, home, and in other capacities. Kim answers these important questions: How do I set them? How do I keep them? How do I get the courage? How do I handle it when others are upset? We all get a lot of pressure from others in our lives to give more: our boss, our kids, husband, friends, church and volunteer commitments…and ourselves, too. Setting boundaries is essentially about self-care. It is about establishing a healthy balance between the needs/demands of those we work for or serve, and our own needs to be a good stewards of ourselves. Kim gives great questions for you to ask yourself, to assess where some healthy boundaries might help. Watch for practical and compassionate help! Kim shares some tips to Sustain Hope…When It is Hard to Keep Hoping. Kim shares where she places her hope, and where she doesn’t. Watch for an encouraging and hopeful message. Check out my longer videos on YouTube. I hope you will find help, hope and comfort here. Kim shares about the power of self-compassion integrated with our faith. Kim shares powerful information and practical tools to help you become a kind and compassionate friend to yourself … especially during difficult times. Kim shares from personal experiences, and her heart is to help others relate to themselves with compassion especially through the difficult times of life. You will find compassion, understanding, hope and practical help here. Kim presents “Self-Compassion in the Counseling Office” to therapists at Western Seminary, Sacramento. She shares about the power of self-compassion integrated with our faith. Kim defines self-compassion, explains the benefits of being compassionate with ourselves, and the consequences to ourselves and our clients when self-compassion is not present. Kim ends the presentation with two powerful role plays that demonstrate how self-compassion helps a client get more connected to herself, find new insights, and help a distressed client regain calm and peace after a difficult session. Turn up the he volume on the role plays to hear. Kim Fredrickson shares with Moms how important it is for Moms to treat themselves with compassion, and gives helpful and practical tools. Kim also answers a Mom’s question about how to process through our emotions when our lives take unexpected and stressful turns. Paul interviews Kim chapter by chapter, about her new book, The Power of Positive Self-Talk. Kim also shares how Self-Compassion has helped her get through significant health crises in the last few years. Part 1 of 2: Dr. Logan interviews Kim about her new book on self-compassion, The Power of Positive Self-Talk. Kim shares the importance of treating ourselves with both truth and grace. As Christians we know that we are forgiven, but knowing it in our head is different than experiencing it in our heart. Kim describes why compassion is so hard to extend to ourselves and the benefits of learning how to relate to ourselves in a more gracious way. Part 2 of 2 – Dr. Logan interviews Kim about her recent health challenges of being diagnosed with breast cancer and pulmonary fibrosis. Kim shares how self-compassion has helped her with the adjustment process, encouragement and practical help to get through tough times, and her hope and faith in God.